Expedia has some excellent Stockholm travel packages waiting for you. Combining your accommodations and airfares is one of the simplest ways to save money on your upcoming adventure. Smart travellers can save up to 16%* by purchasing a package deal on Expedia. Our enormous global database features more than 321,000 properties worldwide and 400 partner airlines. With such a broad range of options, planning your dream holiday will be a breeze! You never have to worry about altering your holiday plans, as we don't charge additional cancellation fees for almost all of our hotel bookings. It can be really nice to just roam the streets when you're in a new destination, but sometimes it's a good idea to have an agenda. Grab your travel schedule — we have some cool ideas for your upcoming Stockholm holiday. There's no such thing as getting bored in this bustling city. The Vasa Museum and the National Museum will make sure you're always on the move. The Skansen and the Swedish Museum of Photography are also some fabulous sights that are worth going to. If only these walls could talk! Picture the transitions of power and passionate arguments that have gone on at Stockholm City Hall. Check for tours for a closer look at this historic building. There's a great range of things to keep you busy in this destination. Try to imagine the secrets and stories hidden in the walls of Stockholm Palace as you behold its gorgeous facade. Still got time on your hands? There's nothing like viewing excellent art when your mind needs a lift. As you marvel at the fabulous pieces at Millesgarden, see if you can find the deeper meaning. No matter how plush your hotel room is, don't spend your stay cooped up in your room or lounging beside the pool. There are plenty of unforgettable experiences to be had! Got a few spare moments? Go to our Stockholm things to do page for a complete list of activities. The large range of Expedia accommodations in Stockholm means that you won't be left out in the cold. That being said — the sooner you book your room in the nation's capital, the sooner you can start organising all your fun adventures. We've got cheap holidays and luxury getaways for every kind of traveller. 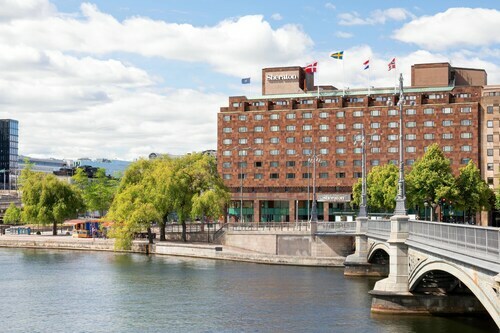 The Grand Hôtel Stockholm (Södra Blasieholmshamnen 8) and the Hotel Skeppsholmen (Gröna gången 1) are two of the higher-ranking choices in Stockholm. Book a room at either and you're bound to have the best rooms in town. Alternatively, if you're travelling on a budget, the Scandic Talk Hotel (Mässvägen 2) or the STF Zinkensdamm Hostel (Zinkens väg 20) might be more to your liking. The airport is rarely the highlight of your getaway, but there's nothing like the excited thrill of knowing that your well-earned trip to Stockholm is not long away! Once you unbuckle your seatbelt at Arlanda Airport (ARN), you'll be 25 miles (40 km) from the middle of town. Go for a walk in this leafy square and explore the interesting shops and restaurants of the surrounding neighborhood. Head to this historic cultural venue to see excellent music performances and enjoy spectacular views of the city. Walk through a tropical rain forest environment to spot hundreds of butterfly species and watch fish feedings or explore a historical park on a Segway. Find model battleships, learn how to build a boat and see the ruins of a royal vessel at a museum dedicated to Sweden’s maritime history. Experience Sweden’s rural traditions and spot almost 300 animal species at the zoo and aquarium that are part of one of the world’s oldest outdoor museums. Come to this park to admire historic buildings, enjoy views of Brunnsviken Lake and visit the museum of a famous Swedish sculptor. Admire contemporary works, take part in workshops and enjoy views of Stockholm’s islands of Skeppsholmen and Djurgården at this museum dedicated to photography. See interesting works of architecture, watch theater performances and attend free cultural events at this central square. Learn about changes in Swedish culture since the 16th century. Find historic furniture and photographs and displays about local festivals and the Sami culture. At this museum and entertainment center, younger visitors to Stockholm can meet famous fairy-tale characters, ride a toy train and watch theater performances. Visit the former home of one of Sweden’s most famous art families. See the rooms where they once worked and walk around the house’s sculpture garden. Enjoy a magnificent view over Stockholm on a gondola that travels to the top of the world’s biggest spherical building.